This week the Corporate & Community Site Index plummeted 14 points to its lowest close ever. Three of the four CCSI sites showed losses, led by TheDryDown; only BaseNotes managed to eke out a 1% gain. The Solo Blog Index moved sideways but with a lot of internal volatility as two big gainers offset three large decliners. 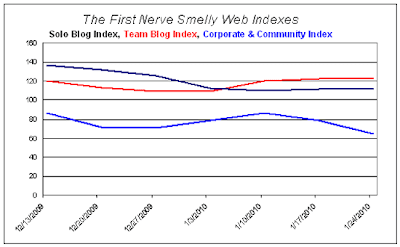 The Team Blog Index notched down one point as three of its four component sites registered small losses. -14% . . . ?!! Quick Jeeves! Fetch the smelling salts for Mr. Branch. Our crack team of First Nerve statisticians assures me that Alexa rankings are prone to sporadic bouts of clear-air turbulence--sudden up- or down-drafts that seem out of whack with the long-term traffic trends. The whimsy of the Alexa bots. Traffic turbulence is more common at the lower altitudes where First Nerve's propeller-driven airship strains to avoid the treetops. At the stratospheric heights where NathanBranch.com flies the big bounce is rare--and thus comes as a shock to the proprietor. According to the stat monkeys, your site has been on a steady climb since August 2009; it peaked at Christmas then, like the composite Solo Blog Index, has drifted down a bit. Let Jeeves fix you a brandy. You'll be fine in no time. Fabulous stats! (Came here via Thedrydown). Dear Mr. Gilbert; I've been recommending your book to everyone and bought it for Christmas for my perfumer-boss. Thank you for such a great read! Thank you for the kind words. I printed them out and taped them over my desk. TheDrydown is a great portal to the fragrant blogosphere and it makes me jealous--I had a similar idea but Grant Osborne and Danielle actually went ahead and did it. Hats off to them. Funny story: I told Dani and Grant about your book when we were having coffee at Starbucks. I showed them the passage about your wish for a community-led publication. (I believe they got in touch with you afterwards?). I'm delighted that I've found your blog! It's a small world or you are very well connected. Do you know Kevin Bacon personally? Welcome to the blog--the party keeps getting bigger. I'll have to make another beer run soon. Don't think I'm particularly well connected except with a few smell-fanatics! Thank you for the welcome. I've already sent two more people to your blog.